The 14 current members of the local PointSAR auxiliary unit carry out patrols, attend community events and assist with search and rescue in the waters between Sombra and Kettle Point. They're among nearly 5,000 volunteers involved in the auxiliary across the country. 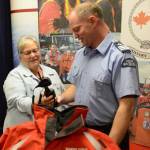 Davidson noted the service provided by coast guard auxiliary has much in common with volunteer firefighters. "I think that it's vitally important that the public recognizes the fact that we've got coast guard auxiliaries," she said. "Often times your work goes unacknowledged but please know that it is always appreciated." The federal government is providing $5 million to the auxiliary this year to support its work across the country, Davidson said. Each year, auxiliary units carry out more than 2,000 rescue missions and save more than 200 lives, she said. Jamie Kerwin, a unit leader with the local auxiliary, said its members typically respond to 20 emergency calls a year. The auxiliary plays an invaluable role, said Peter Garapick, superintendent of search and rescue, with the coast guard. The coast guard has rescue units in high risk areas, but the auxiliary units help fill in the gaps, he said. "They are very, very good at what they do." Locally, the auxiliary patrols and answers calls with a vessel donated by the coast guard. "Without the coast guard, we just couldn't do it," Kerwin said about the support the auxiliary receives. "It's really nice to hear that it's going to continue." The auxiliary works alongside the Canadian Coast Guard, U.S. Coast Guard and other authorities to provide search and rescue on the St. Clair River and lower Lake Huron. "I've got a really good crew," Kerwin said. "I'm proud of them." The auxiliary is always looking for new members, he added.